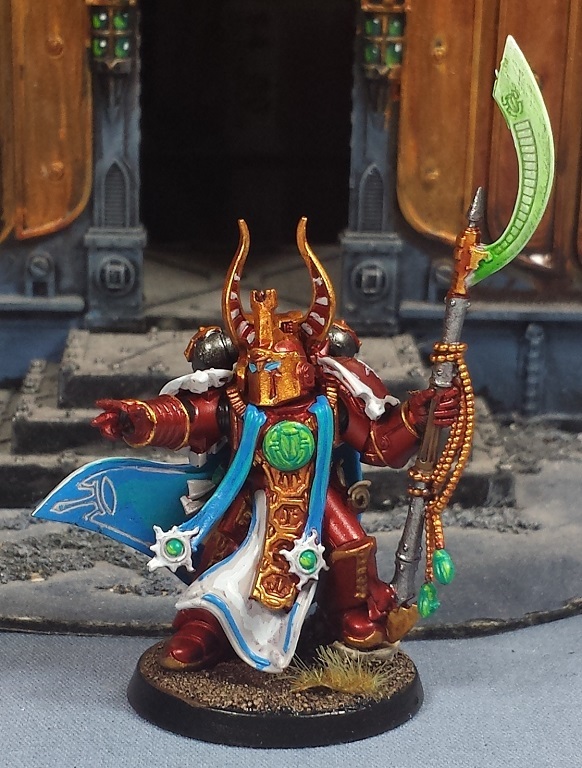 Mordian 7th Regiment: Heresy Era Thousand Sons - Sorcerers Complete! 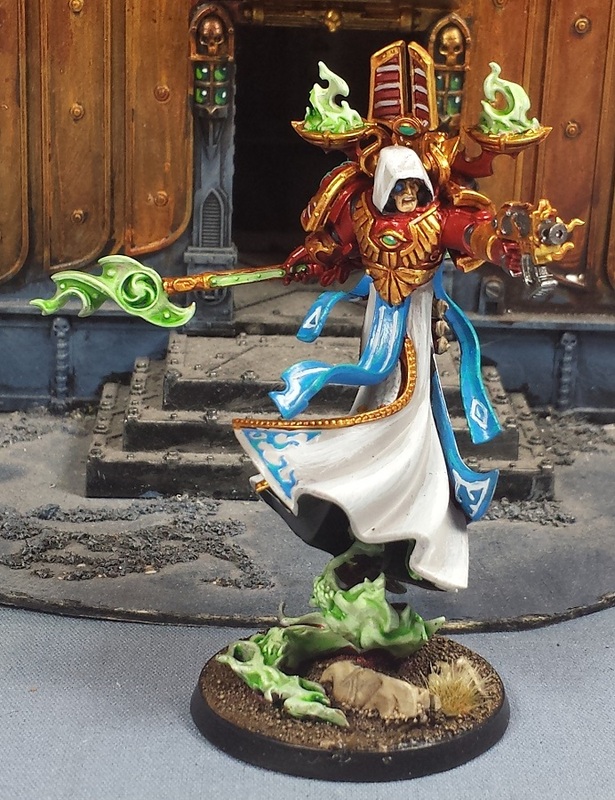 We had a couple nice days and it was temperate enough to get the sorcerer cabal flocked and sealed! Brace yourself for a mess of pics! Gotta have the full group up first - Everybody pose for an action shot! 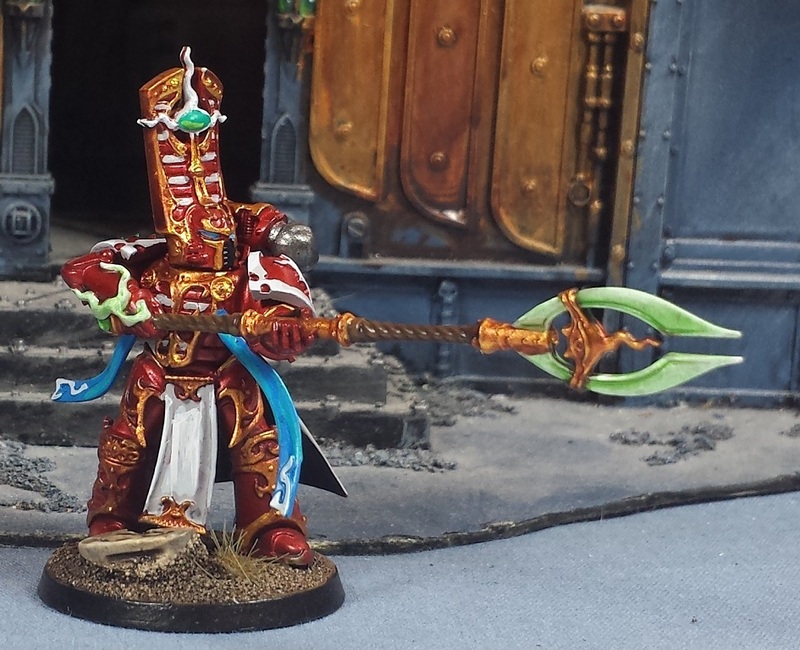 The leader of the current force, Sorcerer Lord Sethep Khet is the commander of the Khamasiin. 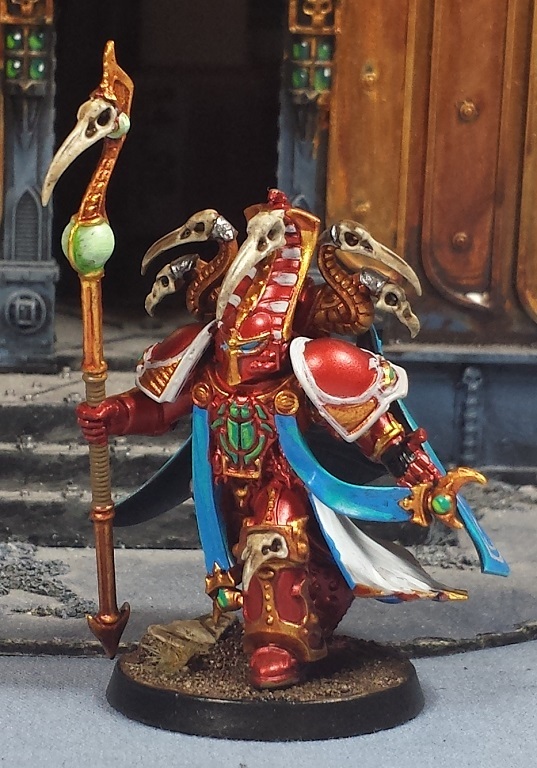 Borne aloft by the twin flames of his devotion to the cult of the Pyrae, and the burning hate for the loyalists who destroyed his legion and his home. 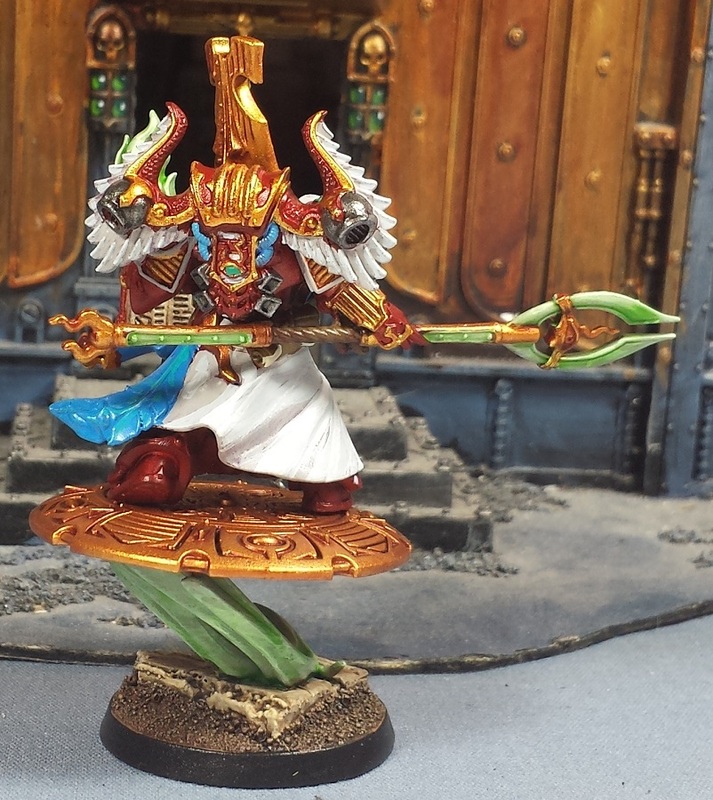 Sorcerer Adept T'khat-Mose joins the Hyskos Sky-Chariot unit (jetbikes), riding on his personal Disc. 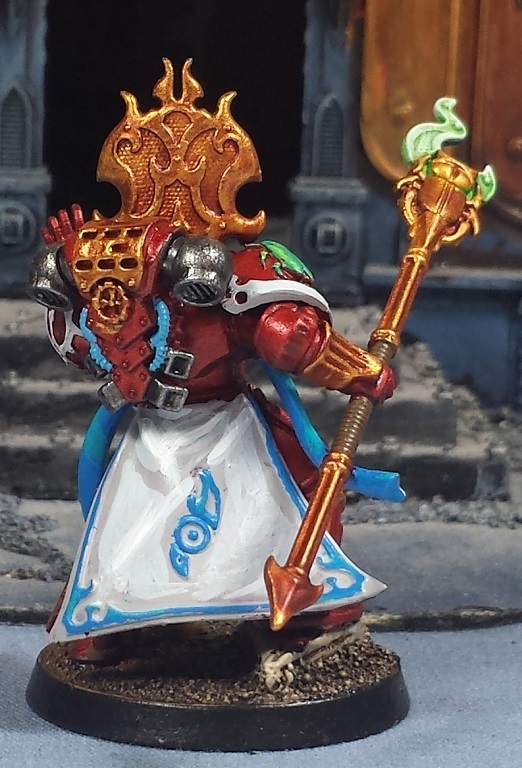 Definitely my second-favorite model, pretty pleased with the flame in his hand - He too is a disciple of the Pyrae. 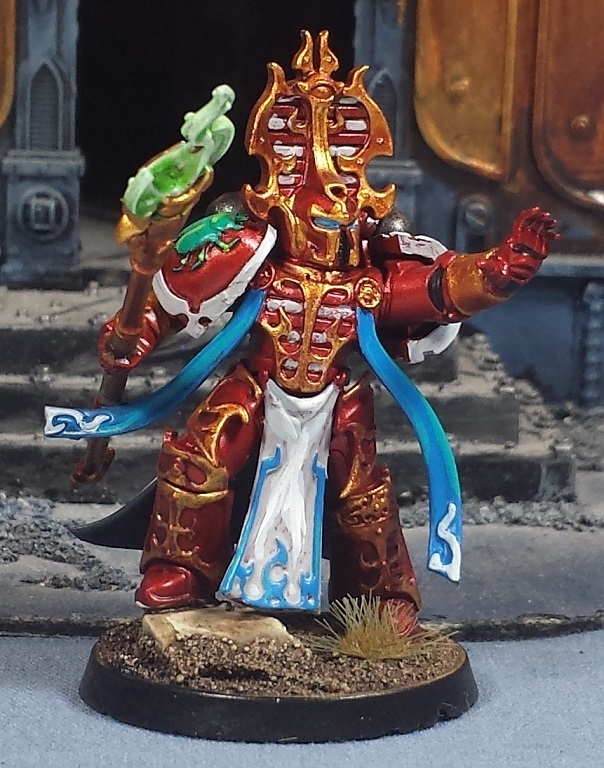 The second Sorcerer Adept of the force, T'khat-Enkhanen is struggling with the flesh-change but has found new depths of resolve in his constant war to keep his form stable. 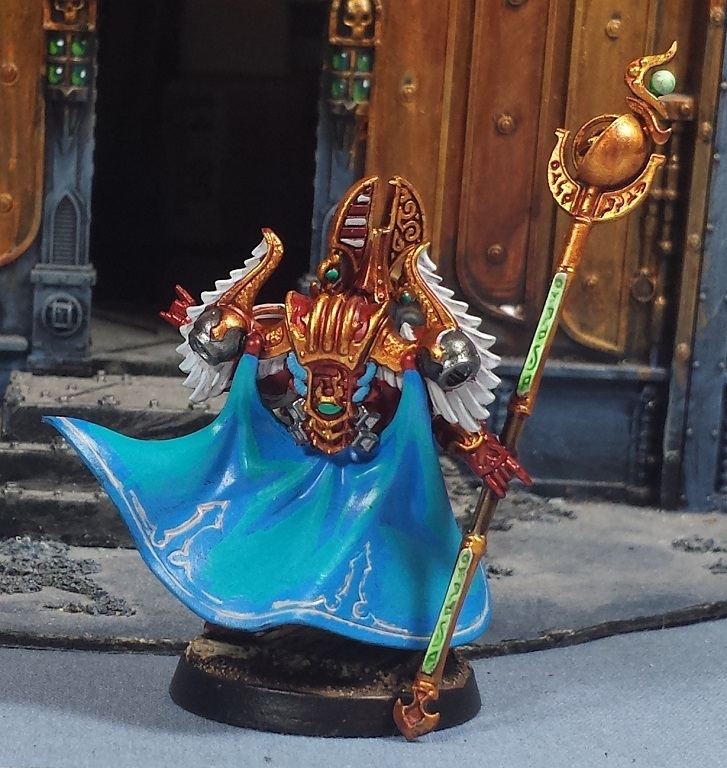 Adept Asherat follows the Raptora, his fearsome telekinetic powers further bolstered by the constantly-rotating psychic astrolabe atop his force staff. Adept Jamshid is a devotee of the Corvidae cult, which shouldn't come as a surprise. 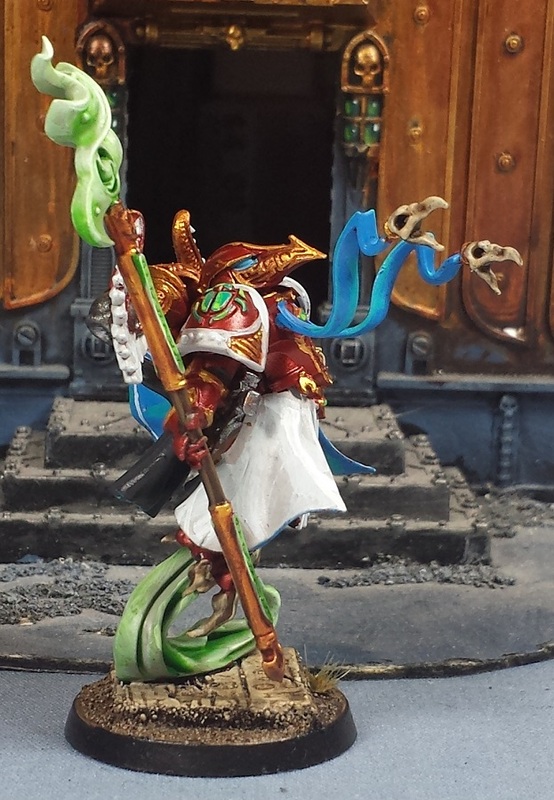 Even his fellow sorcerers thing he's carrying the bird motif a little too far. 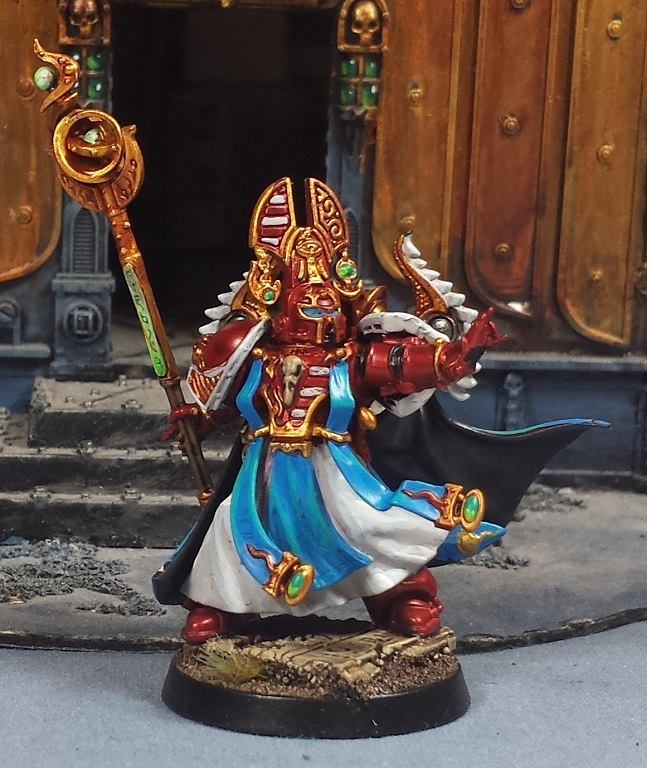 Acolyte Khonsu is one of two lesser wielders of the arts, and generally accompanies one of the Veteran or tactical squads in to battle, providing further psychic might. 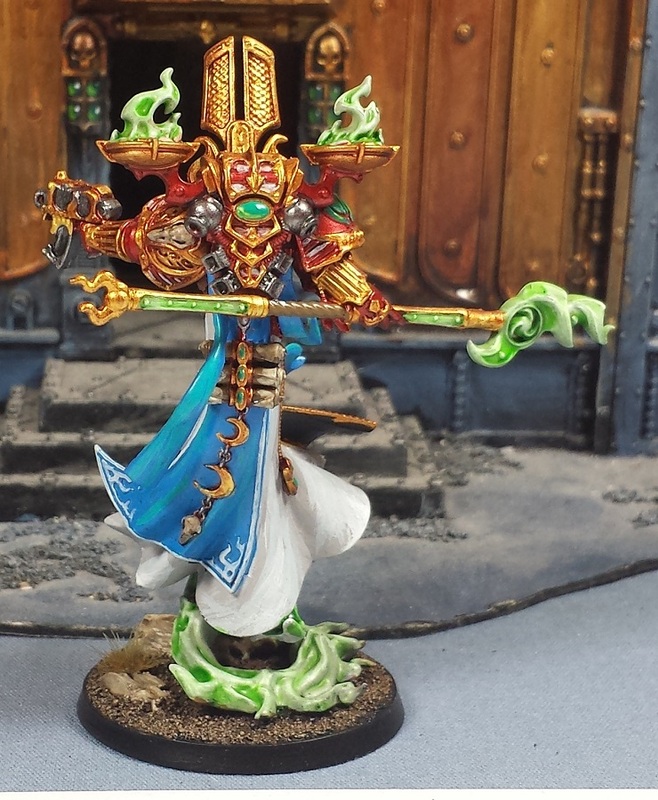 Acolyte Djet is the second subaltern psyker of the force and like Khonsu generally skulks around with the support squads. 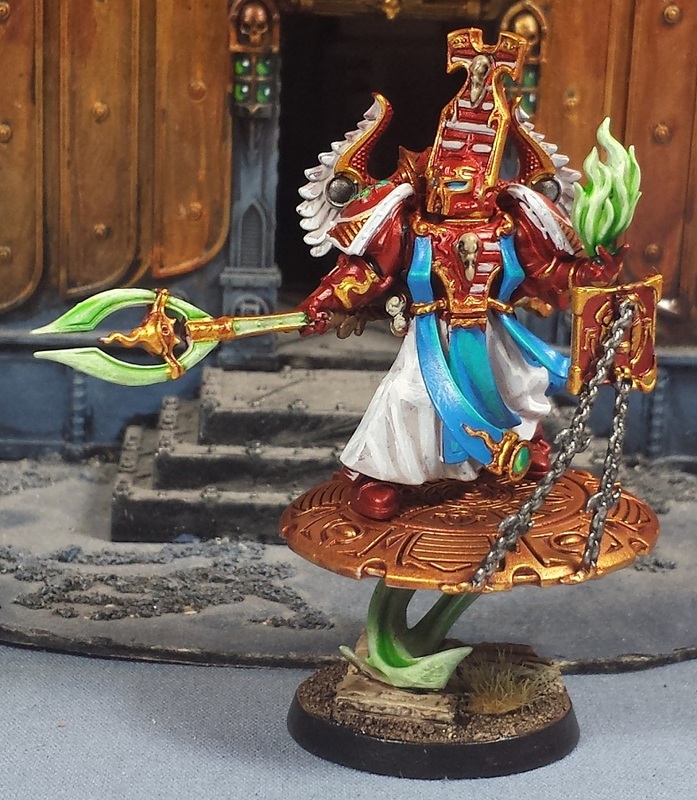 As a secondary 'named character', the Khamasiin is occasionally allied with other fragmented elements of the the shattered Thousand Sons legion prior to the Scouring and the Legion Wars. 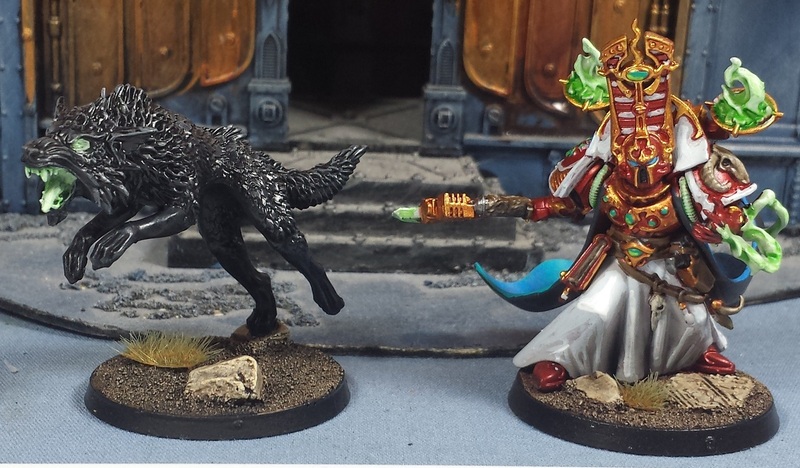 Prior to become a founding member of the Black Legion, Iskandar Khayon and his daemon-wolf Gyre led diverse elements of the sons of Magnus in a last ditch attempt to prevent Ahriman from completing his Rubric. 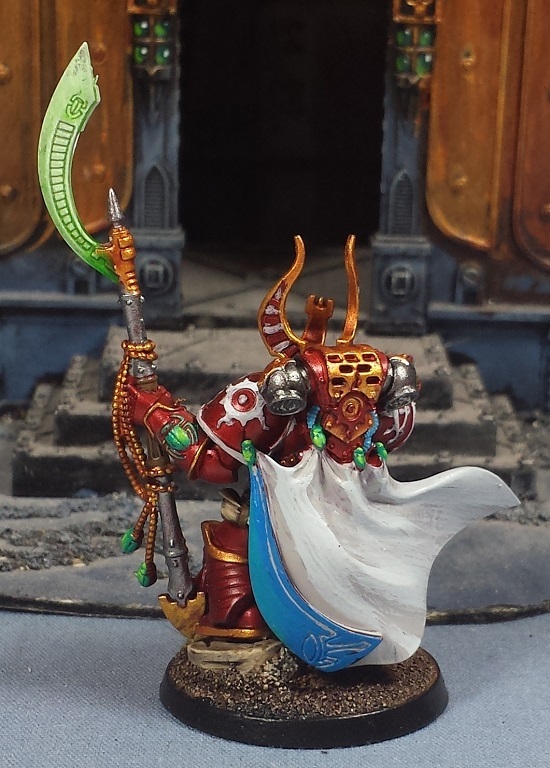 The villain of the piece, Azhek Ahriman will not take the field in this instance of the army, but will be used in the vignette I'm planning! 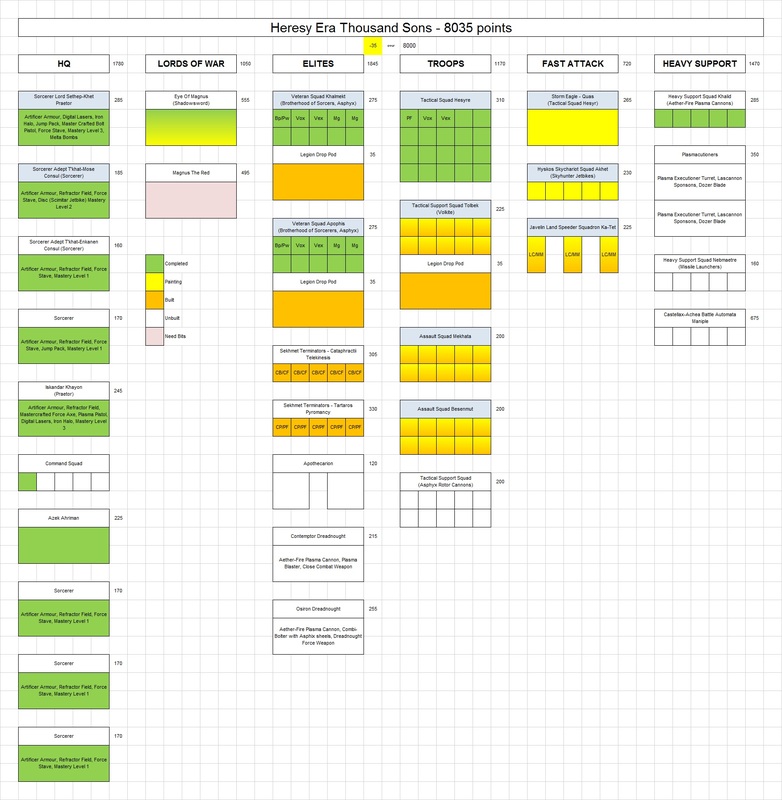 With that a goodly chunk of the painting chart turns green, which is always a good feeling! Next up, going to switch gears a little and work on the Thallax for the NOVA charity army. 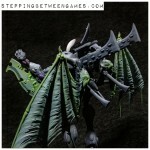 Pics to follow of the work done so far! You are an absolute machine!!!! Good work chief. They all work well together as a group. A whole lot of psychic potential there. 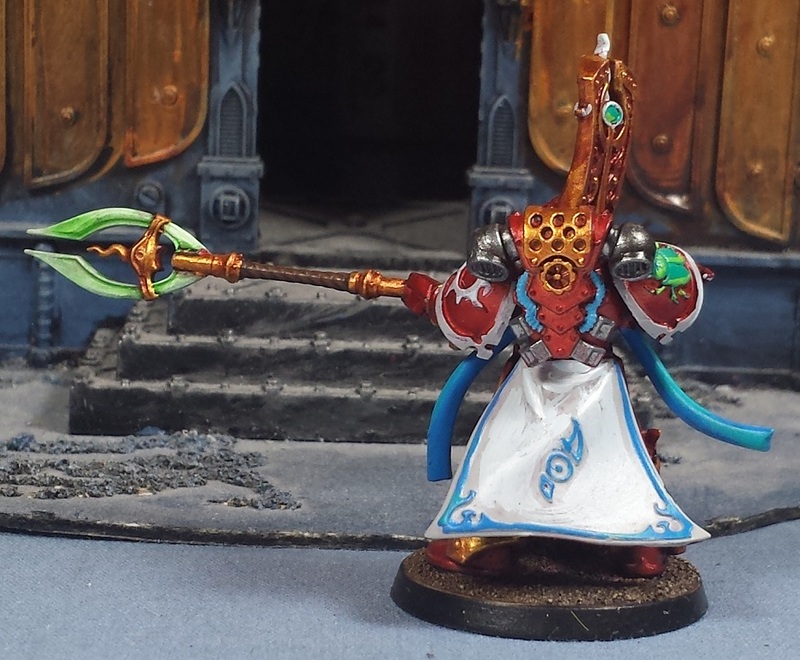 These have a wonderful arcane feel to them, especially the floaty guy. Well done! These turned out absolutely stunning. Bravo! @Riot: Thanks man! A little bit every day! @Rory Priest: Thanks bud! 20 psychic dice is probably too many, right? @Greg Hess: I appreciate it! Looking forward to throwing down with you and Rory at NOVA! @#2501: Cheers man! 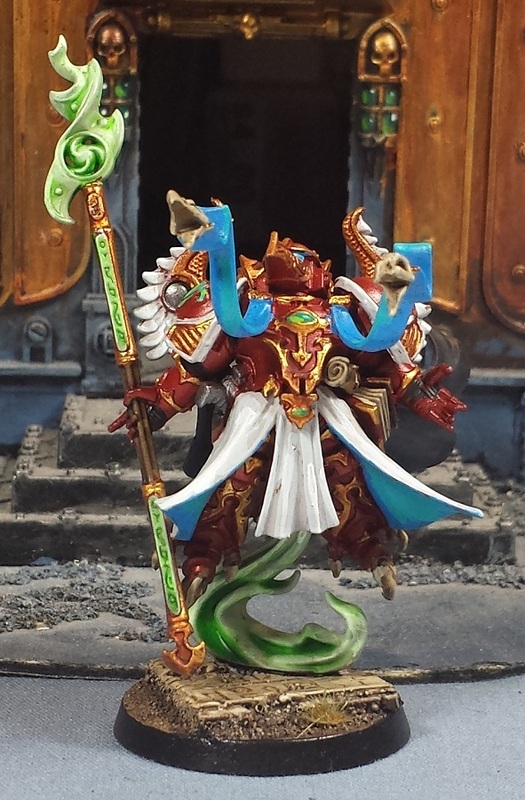 The new exalted sorcerer kit has so many cool options! @CJ Kilbride: Thank you very much, CJ! 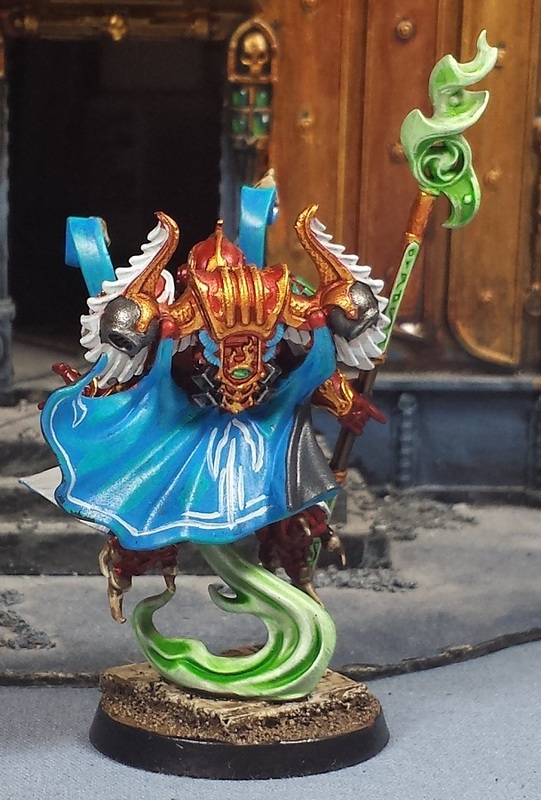 Hello I have a question about the rules for these sorcerers. 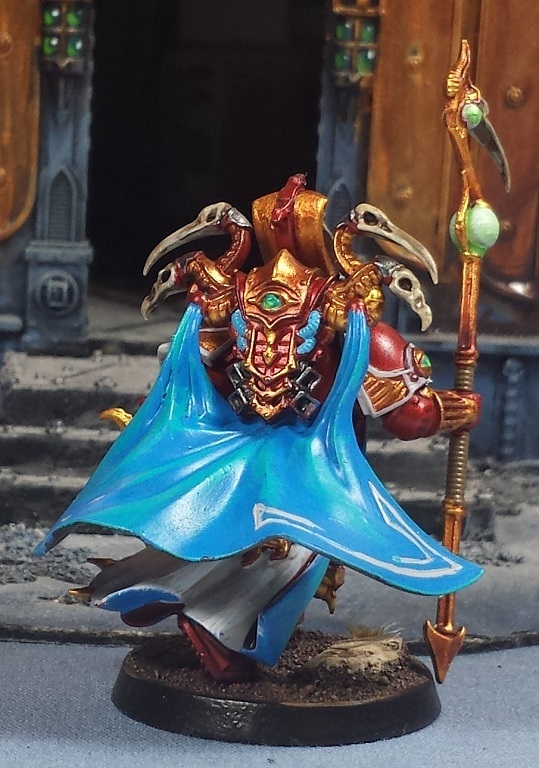 I checked the book Inferno and I don't found any rules about a unit of sorcerer. Can you tell me which rules you use? By the way you did a really nice work! @Marc Raley: Thanks very much, man! @Joe B: Hah! It's certainly a bunch of psychic baloney! 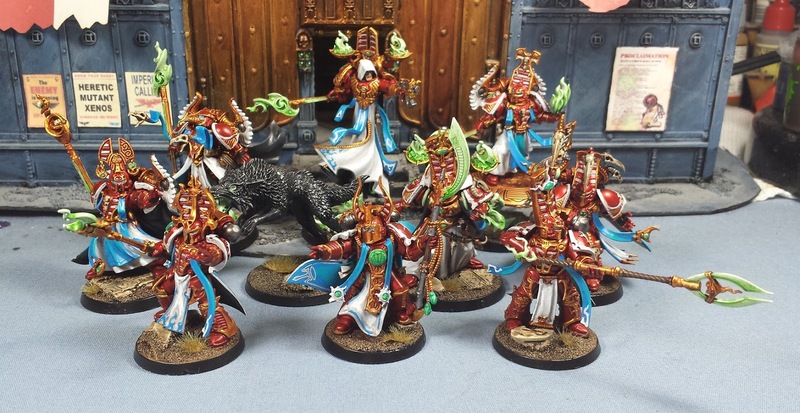 @Leto9fr: Cheers, They're not technically designed to run as a unit on the table, it was mostly that I just couldn't stop building sorcerers. It got out of hand! At any given time I'll only really ever be able to field three of 'em at a time.